Xenia senior Logan Bilbrey slides safely across home plate with the winning run before the throw from the outfield can get to Fairborn catcher Jacob Moore, in Tuesday’s May 7 sectional high school baseball tournament game at Xenia High. 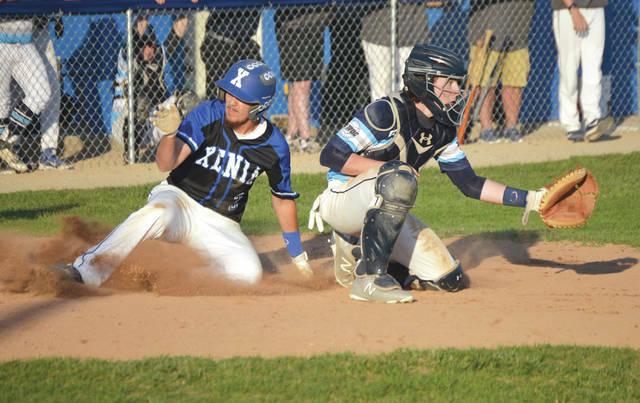 Xenia needed extra innings to claim a 2-1 win over Fairborn. 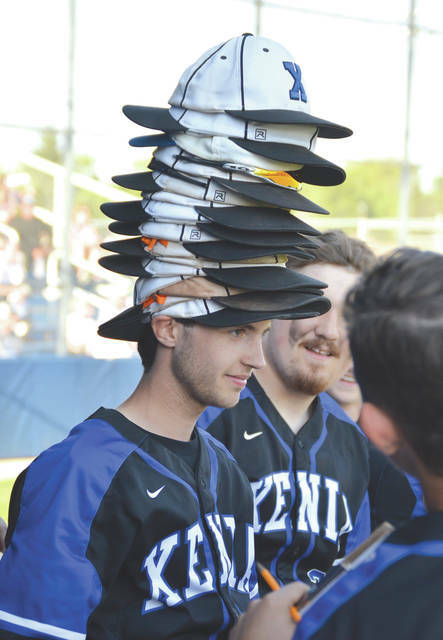 Xenia starting pitcher Dylan Hall wears the rally caps for the entire team in the seventh inning of Tuesday’s May 7 Division I baseball tournament game against Fairborn. It didn’t work that inning, but the host Buccaneers eventually claimed a 2-1 win in nine innings. Xenia catcher Alex Sparks waits to apply the tag on Fairborn’s Andrew Yeary for an out in the third innings of Tuesday’s Division I sectional baseball tournament game at Xenia High. The host Buccaneers won the game, 2-1 in nine innings. Jacob Moore of Fairborn races around third and heads for home with Fairborn’s only score of the game. Moore scored from first base on Mark Peterangelo’s RBI single to right field in the third inning, May 7, at Xenia High School. 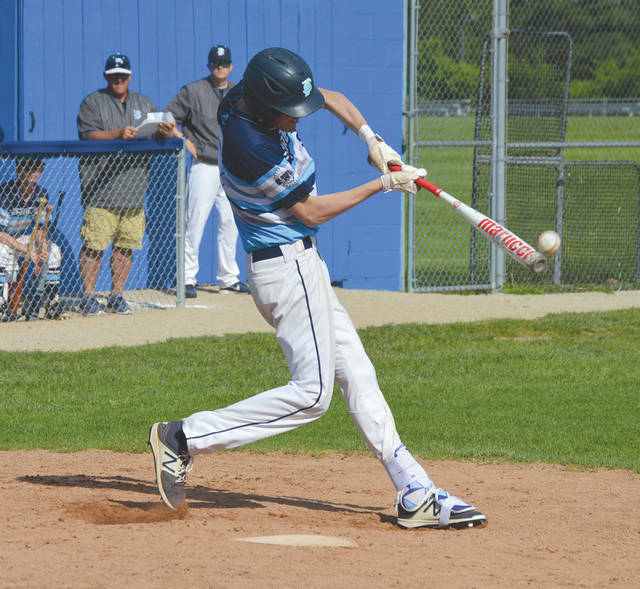 Fairborn’s Garrison Secrest makes contact with an inside pitch for a flyout to short in the second inning of Tuesday’s Division I sectional baseball tournament game. The first-round game was won by host Xenia High, 2-1, in nine innings. 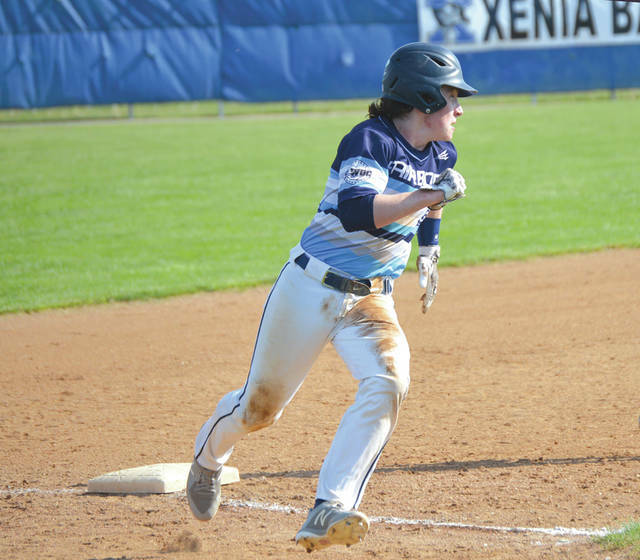 XENIA — Freshman Aydan Evans smacked a deep fly ball into right field to score Logan Bilbrey with the winning run in Xenia’s 2-1 extra inning win over league rival Fairborn, May 7 at Xenia High School. The host Buccaneers had the rally caps on, or at least starting pitcher Dylan Hall did — all of them were on his head — in the seventh inning, but it took two more innings before Xenia could push Bilbrey across with the winning run. Xenia coach Barry Claus joked that Evans prefers to do his talking with his bat. Among Bucs players who have been in 25 games or more this season, the freshman is second on the team in batting average (.367). His deep fly to right field scored the team’s leading hitter, Logan Bilbrey, from third with the game winner. “I was very nervous,” Evans admitted. 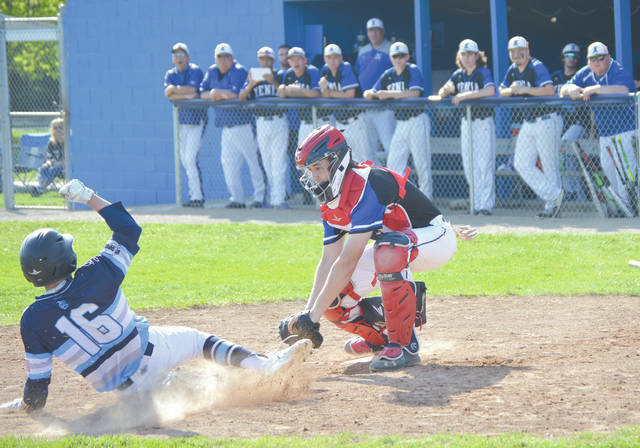 The two Greater Western Ohio Conference American South divisional rivals each scored a run in the third inning. Visiting Fairborn got on the scoreboard first. Skyhawks catcher Jacob Moore led off the inning with a walk, then raced around from first to score on Mark Peterangelo’s single to right field. After Andrew Yeary got on base with a single to center, he tried to pull the same first-to-home feat on Kahlil Lettice’s single to right, but Ben Salyers gunned him down with a perfect throw to Xenia catcher Alex Sparks for the out. Fairborn could manage just seven hits over the nine innings. Hall pitched deep into the ninth inning, racking up more than 115 pitches in the game, striking out five Skyhawks. Warren Mahar then came in to retire the final Fairborn batter on a strikeout in the ninth. The win was Xenia’s third over Fairborn this season. “It’s exactly what we thought. A 5-4 game, a 7-4 win … we knew it was going to be a tight game. Dylan goes out and throws 8 2/3 innings for us. … We’ve been in a lot of tight games. You look at our schedule, there’s a lot of tight games in there. We’ve just been able to find a way to win. “This team isn’t going to blow anybody away with the eye test when we step off the bus. But you can’t measure the amount of heart these kids have. I’m proud of them. That’s a school-record 20-win season for them. League champs,” Claus said. Fairborn’s season comes to a close with an 11-15 overall record. They lose one senior — Will Coleman — from this team. Xenia (20-8) advances to take on Troy (16-8). The Trojans are the tournament’s No. 3 seed and will host Xenia at 5 p.m. Thursday, May 10 in the Dayton 3 sectional semifinals. The winner will then face either Wayne or Northmont in the sectional title game, which is set for Thursday May 17 at Centerville High School.